Gibson Roy: Happy 4th of july. Happy 4th of july., originally uploaded by Venus In Furs. What with me being exhausted all the time now and it being in the mid 90s outside, we've had a very low key 4th of July. Todd's putting together a new dresser for baby #2, and we had a traditional all American dinner of (Pat LaFrieda) burgers, fries and fresh corn on the cob. 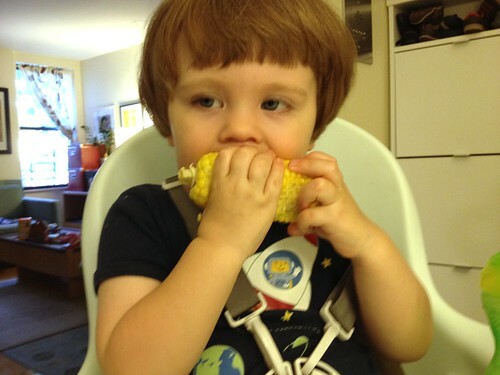 Gibson loves him some corn on the cob.